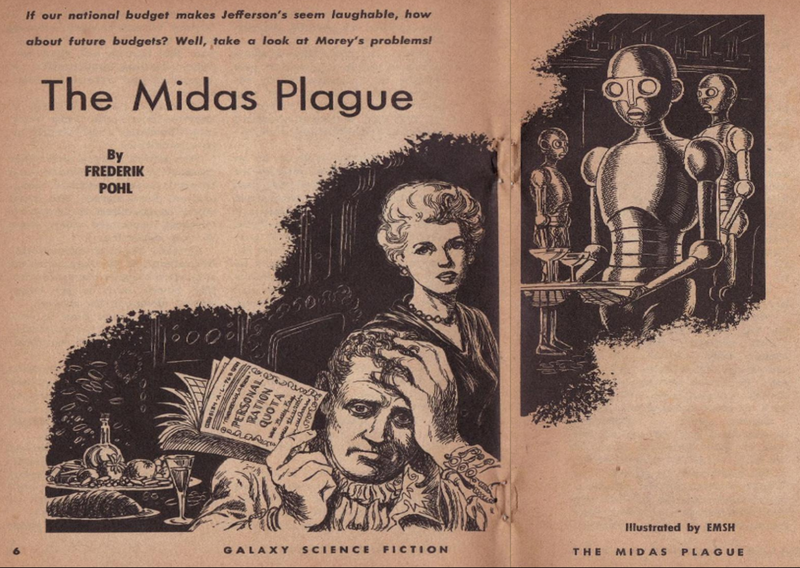 Frederik Pohl, "The Midas Plague" (1954). Online. A topsy-turvy world satire with a lot of very intriguing material in it. A great story for thinking about the fact that scarce, as a technical term of economics, is not the same as limited. Rather, scarce means limited in relation to demand (or desire), and "The Midas Plague" plays with the idea of of manipulating not only the production of resources, but the demand for them (via those eleven psychologists, and of course the bit at the end). Pohl doesn't r-e-a-l-l-y rationalize the initial conceit very rigorously, but perhaps in 2016, with the benefit of CAP surplus foodscapes, with the New Public Management of the 1980s onward and the attendant financialization (and therefore consumer-ification) of public and civic life, the case might be easier to make. Also see "The Waging of the Peace" (1959). Mild spoiler: in the future, the rich have the luxury of living modest lifestyles, while the "poor" have to constantly consume.